'Rocky' was originally written by Jay Stevens in 1975 and performed by two different American artists: Austin Roberts, who recorded it as a pop song and Dickey Lee, who had a hit in the country charts with it. Frank Farian had only just recorded one song, 'Baby do you wanna bump' as Boney M, but the group did not exist as such yet. 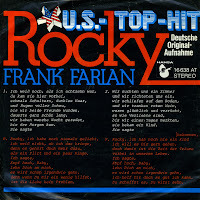 His next single was a German version of the song 'Rocky'. He didn't just score a hit in Germany with this, but also reached number 8 in the Dutch Top 40. A few months before that, a Dutch version performed by Don Mercedes reached number 1 in the same chart.